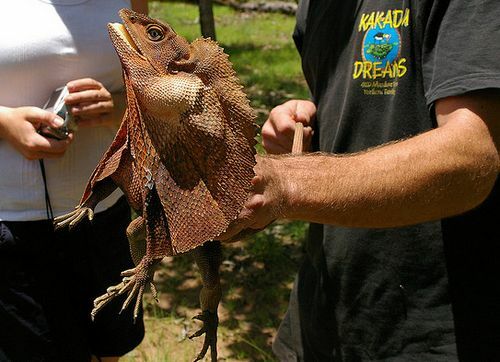 The Australian Frilled Lizard is the most popular of our lizards because of its unusual looks and behaviour. 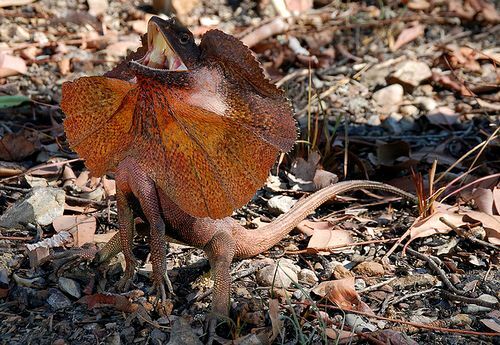 Frilled Neck Lizards certainly do their best to look like a scary dragon when they feel threatened, but looks is all there is to it. They are perfectly harmless. Wait till you see them running, it looks so funny, you probably can't help laughing. 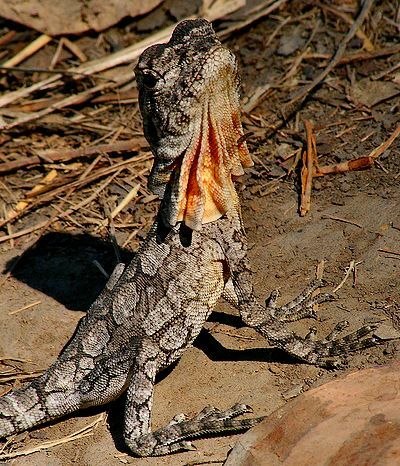 Australian Frilled Lizards (Chlamydosaurus kingii) belong to the family of dragons, as the name Frilled Dragon indicates (the proper scientific name of the family is Agamidae). They are a fairly big lizard, growing to over 90 cm (ok, the tail makes up about two thirds of that length), and weighing up to half a kilo. 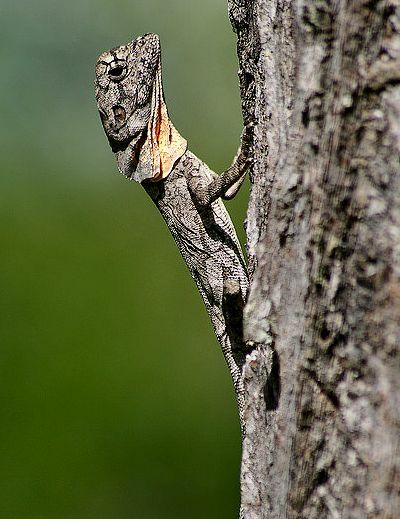 Frilled Neck Lizards rely on camouflage for their safety, so their mostly grey and brown colours match those of their surroundings. Lizards from different regions will have different colours. The only brightly coloured body part is the actual frill around their neck, which often contains bright red and orange scales. The frill is usually folded back around the shoulders and the colours are hidden. It helps the lizard to look like the branch it is sitting on. To open the frill the lizard opens its mouth widely. Somehow the muscles of the jaw and the tongue are connected to some cartilage in the frill, opening the frill like an umbrella. 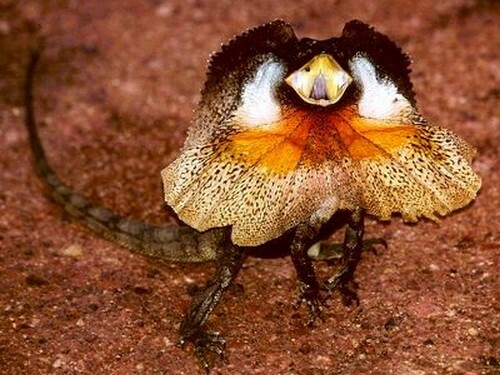 Like most lizards our Frill Neck Lizards prefer warmer climates. 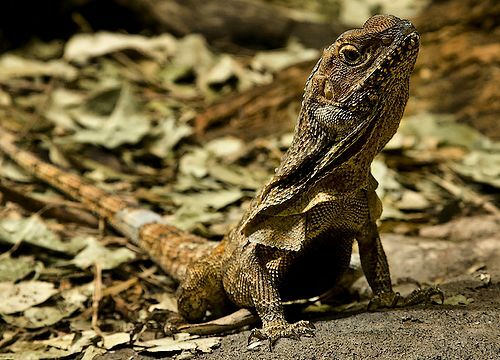 Although often referred to as Australian Frilled Lizards they are in fact at home in Papua New Guinea, too. In Australia they live across the tropical north and along the east coast. 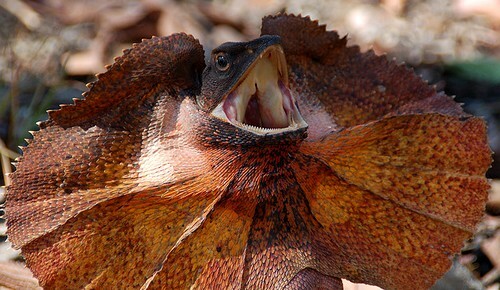 Frilled lizards used to be found as far south as Brisbane. Luckily most of northern Australia is rather devoid of people, and Frilled Neck Lizards are still plentiful here wherever there are trees. Another concern is predation of Frilled Neck Lizards by feral cats. Cat numbers are exploding all across northern Australia, and our birds and lizards don't stand a chance against this highly efficient killer. The Frill Neck Lizard is no exception. 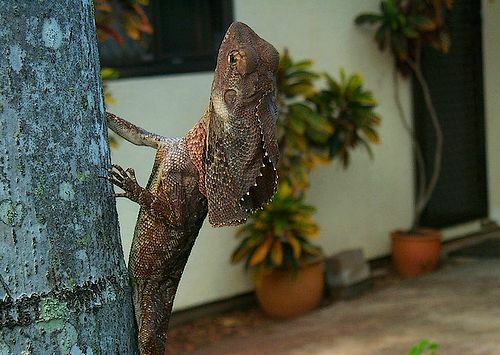 Frilled Neck Lizards are tree dwellers and excellent climbers. In fact, they spend over 90% of their time in trees. 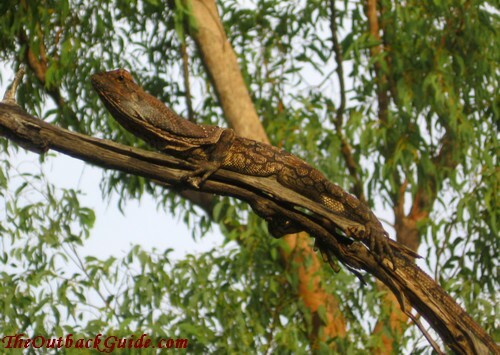 Australian Frilled Lizards are carnivorous and hunt for their food in trees and on the ground. In the trees they find spiders, cicadas, beetles etc., and on the ground more of the same plus ants and even other small lizards. Their eye sight is excellent and they are very fast. If they spot something from a tree they drop to the ground, grab it and are back up on the tree within seconds. As I mentioned above, they mostly rely on camouflage to protect themselves. Whether in the tree or on the ground, a Frilled Neck Lizard with its frill folded around the shoulders, lying down and perfectly still, blends in very well with its surroundings and is hard to spot. The lizard opens its mouth to expose the strong teeth, which also opens the impressive orange frill, making the lizard look twice as big. In addition it rears up on the hind legs, hisses, thrashes its tail on the ground, and it might even jump towards an attacker hoping to scare them off.